What are the Best iPad Pro 9.7 Cases With a Keyboard Available? Now you have purchased your iPad Pro 9.7, you may need to consider which is the Best iPad Pro 9.7 Case with Keyboard to help with your productivity and protect your new iPad. Apple is advertising its most powerful and priciest iPad to date, as a device that is capable of replacing laptops. The 9.7-inch iPad Pro has a faster processor than any other iPad available. Apple has claimed that this new model can rival most portable laptops. Apple are targeting the iPad Pro at the business, multi-tasking user. However, in order to make this device into a more productive machine that can support your workflow, you’ll have to connect it to a keyboard. Although the impressive 9.7-inch display of the iPad Pro offers plenty of room for typing, there’s nothing like the feel and accuracy of a good quality keyboard. There are some excellent choices for an iPad Pro 9.7 case with keyboard. These are already available and can help you be more productive with your emails, spreadsheets, and much more. Here are the Best iPad Pro Case With Keyboard that you can buy. This full-size keyboard is Apple’s official keyboard for the iPad Pro. It is designed specifically as a companion product for the iPad by using the smart connector. No Bluetooth is required as the connector allows for charging as well as two-way data exchange. When not in use, the 4mm thick Smart Keyboard doubles as a protective cover for the front of the iPad. It has a water-resistant and stain-resistant design and with no crack between keys it is also spill-resistant. 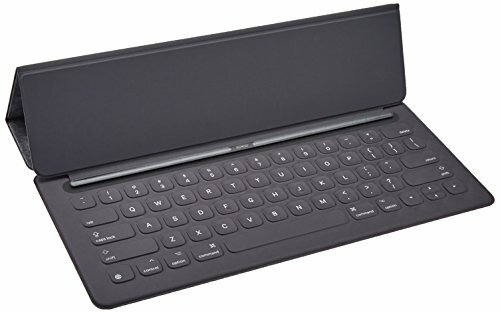 The keyboard is very simple to mount on to the tablet. As it uses power from the iPad Pro, you don’t have to charge a battery in the keyboard to use it. If you set the screen brightness on the iPad Pro a little lower, you can get more than 10 hours of battery life. The keys have a nice soft bounce to them and work well once you get used to them. The Logi CREATE has been made specifically for the iPad Pro. It connects to iPad Pro via Apple Smart Connector which means that it does not use Bluetooth for either pairing or charging. Its keyboard is full-size and back-lit for easy typing. It also has a special row of iOS shortcut keys that puts the power of the iOS apps at your fingertips. Unlike the Apple Smart Keyboard, the CREATE offers two viewing angles. The Logi CREATE protects your iPad Pro on the inside while leaving the external ports easily accessible. The magnetic connection between the iPad and the keyboard is powerful and won’t come loose or separate. Getting the iPad Pro into this case can take a bit of effort. Once in, you won’t want to take it out, and hopefully you shouldn’t have to. On the outside, tightly woven premium fabric resists bumps, scratches, and spills. The Apple Smart Keyboard is small and lightweight and truly turns the iPad Pro 9.7 into its ‘laptop mode’. This is lighter and is easier to add or remove from the iPad Pro 9.7 compared with the Logitech CREATE. If you don’t need a cover that completely protects the whole iPad then you should choose this option. 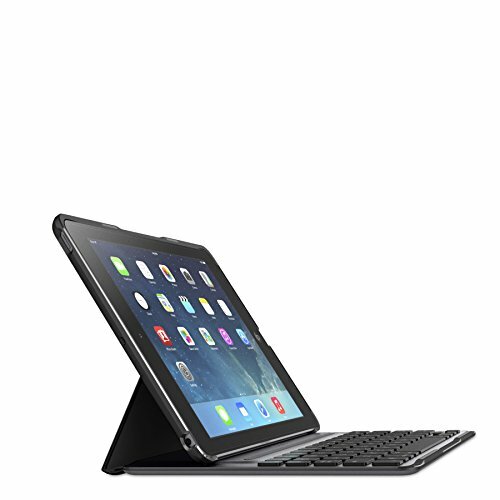 The Logitech CREATE iPad Pro Case with Keyboard is a more traditional case that covers the whole iPad Pro 9.7. It has a back-light which you may find helpful in not-so-well lit areas. Although it adds more weight than the Apple Smart Keyboard, it offers the same ‘laptop mode’ experience. What’s your favorite iPad Pro 9.7 Case With Keyboard? From our list of keyboards for the iPad Pro 9.7, which one would you consider? There will surely be more to choose from in the coming weeks, from other popular manufacturers, if none of these pique your interest. Let us know how you prefer to tackle your typing on the new iPad Pro by leaving a comment in the appropriate box.